Byron Davis (right) used the end of his sentence in Limestone Correctional Facility near Huntsville, Alabama, to get ready for his next step: searching for work back home in his community, just outside of Birmingham. He intended to put his conviction for dealing drugs behind him. Davis met staff from IMPACT Family Counseling on the inside at Limestone, where he served a 26-month sentence. A faith-based organization, IMPACT runs pre-release reentry coaching and skills-building classes for people in the correctional facility, who may continue to participate in IMPACT’s post-release programs when they return home. Davis said that the pre-release classes gave him a mental checklist for planning his reentry. 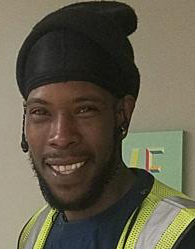 They helped him not only identify what he needed to successfully reenter his community, but also recognize the supports he already had in place. Davis was fortunate to have secure housing—on the day of his release, he could go home to his own family. But he needed help in other areas: he had to get a handle on the skills he would present to an employer and prepare for job interviews where he might need to speak about his past conviction.